Laundry room organization is the key to speed and efficiency – giving you more time to do other things! For me, organizing the laundry is particularly vital – with a family of 7, I’m sure you’ll understand why! I envy those that have one day a week to do laundry. “Oh, I do laundry on Thursdays”. That would work well for a in some households – but if I did that I would be doing wash for the entire 24 hours! Instead, I often do a couple of loads a day, so it’s something I have to stay on top of – especially with being a work at home mom. I have to make every second count, which is why it’s important to get organized now and stay that way. 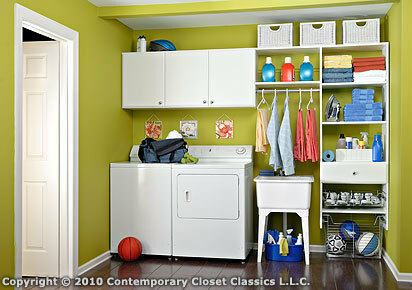 A good laundry room has both a washer and a dryer and should have room to store the laundry items you use. Ideally you want to be able to quickly do the duty with little to no fuss. To go from pile of dirty clothes to wash to dry to folded and put away. Aside from hiring a maid to do this here’s some pointers for laundry room organization and making this an easier job! Pre-sort the laundry ahead of time. If you can teach the others in the home to drop in their dirty clothes into baskets or bins clearly marked: whites, colors, towels, sheets, bulky, etc, that’s a big help. How you sort your laundry is up to you – some people don’t mind mixing it up while others prefer to separate everything. The above is how I do it – it’s what works well for us. Have the laundry detergent, fabric softener and or bleach either on a shelf above the washer or off to the side – within hand’s reach. So when you are filling the washer you can quickly grab these items. Have the dryer sheets on top of the dryer – or at least within hands reach. Quickly put wet laundry into the dryer, grab a sheet and go. Keep hangers nearby, so you can pull items out of the dryer and put directly onto a hanger. If you do this quickly, many items won’t need ironing! Keep a basket for each family member! When pulling clothes out of the dryer, throw them into each basket, then hand the basket to its owner for folding. If there’s room, have hooks on the wall to quickly hang clothes if you don’t have time to place them on hangers. This saves you time spent ironing later. If you’re hanging out your laundry to dry (which is greener and far more frugal than using a dryer), hang it in different ‘sections’ of the washing line, according to who it belongs to! On MY line, I have all the baby’s clothes at one end of the line, followed by hubby’s clothes, followed by my eldest daughter’s, etc etc. When it’s time to get the laundry in, you can fold it straight into the laundry basket and it’s already sorted into piles for each family member. If items need ironing then this won’t be so helpful – but if they don’t (and I hang things out very carefully to avoid as much ironing as possible) then they can simply be given straight to each family member to put away! If space is an issue, make use of the top of the dryer. Purchase an inexpensive shelf to hang over the washer. Check out the household organization aisles at the store. There are all sorts of neat plastic containers and caddies you can use to assist you with your laundry room organization. I hope these laundry room organization tips have been useful – please feel free to contact me with tips of your own!